minutes to reveal its 176,400 square foot opening. 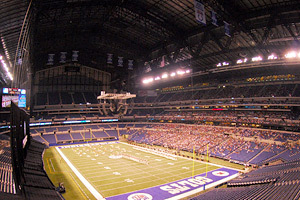 During a scheduled conference call last night, the voting members of Drum Corps International voted 11 to 9 in favor of opening the retractable roof at Lucas Oil Stadium in Indianapolis for the 2010 World Championship Quarterfinals on Thursday, August 12. "Since the conclusion of the 2009 Championships, we've been working closely with stadium management and city representatives to address concerns over the sound in the stadium," said Drum Corps International Executive Director Dan Acheson. "Fans may notice a number of additional measures that have been incorporated into the stadium setting for this year's event to vastly improve the listening environment. Other improvements will be less visible while still enhancing the experience for performers and fans alike. If the weather cooperates this August, we will be able to gain additional insights from the open roof which we can take into consideration for the planning of future World Championship events." 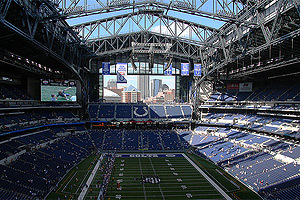 Under the 2010 plan, the roof will remain closed for the Open Class and World Class Semifinals and Finals competition. the duration of the inaugural World Championships in Indy. "Stadium management will make the final call on closing the roof should weather become an issue, but based on the direction of the voting members, we will proceed with planning for an open roof for the last 15 corps to perform at the World Class Quarterfinals," Acheson said. "The roof will remain closed during the heat of the day and through the first group of corps so that the air conditioning can keep the building cool. During the first intermission, the roof will be opened and will remain open – weather permitting – for the rest of the evening. It will be closed again following the last Quarterfinals performance and will remain closed for the remainder of the week." Speaking to the members in favor of opening the roof was George Hopkins, executive director of the Cadets. "Although we know that there won't be as many people in the stadium on Thursday as there will be on Saturday night, opening the roof will give us the chance once and for all to understand the difference that's offered by taking advantage of the option. It's in our best interest to give it a try and to hear for ourselves how the open roof will make a difference one way or the other." Presenting the counterpoint was Santa Clara Vanguard Chief Executive Officer Jeff Fiedler. "At that point in the season we want to give the kids the best opportunity from night to night to night with consistent conditions to be better each performance. All having the roof open on Thursday is going to do is give people something to talk about and debate for years. People will say, 'Well it was closed for us … Well it was open for them …. Well they had an advantage.' My biggest fear is that [opening the roof] is going to be inconclusive, and we're going to end up with a bunch of experts on both sides of the issue."